I remember first watching the trailer for the new Film Sinister a few months back and I joked about how it seemed similar in title and theme as 2011’s horror hit Insidious. We got demons we got ghost children, we got moving to a house and the titles are nearly identical. Now that I’ve finally watched Sinister I can safely say that they are indeed different films. 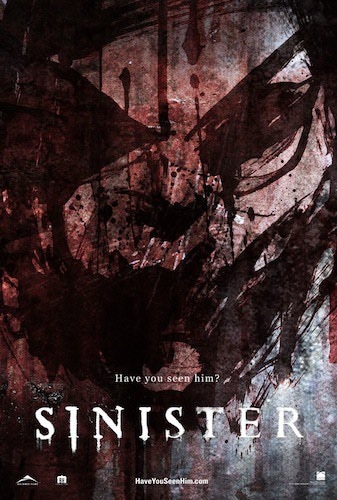 Sinister is directed by Scott Derrickson who’s no stranger to the genre having dipped his pen and sat in the director’s chair for a couple of horror films already. Starring in the movie is Ethan Hawke who’s had a lengthy and critically acclaimed career already. Hawke plays a true crime writer Ellison Oswalt. Ellison experienced a major hit 10 years ago when he wrote a book called Kentucky Blood. The fame afforded him money, countless interviews; the story was made all the more remarkable because in that case he stumbled upon something the police had missed. Sadly all things come to an end and with two failed books behind him Ellison is desperate for one more hit so he can have financial and personal stability. He brings his family to a house in a small town where a grizzly murder occurred in which a family was hung to death from a tree. (We’re treated to said hanging in glorious 8mm at the beginning of the film). At this point in the story we watch as Ellison’s wife Tracy (Juliet Rylance) and two young children basically adjust to having their lives uprooted again. Tracy is probably the least likable character. I get that she was supposed to be tired of the true crime business and didn’t want her husband writing another – especially since his books tend to make him notorious among the local police community- but she was flipping out about everything. Nag nag nag…anyways. The scares happen when Ellison discovers a strange box of old 8mm film and projector in the attic. He watches them and quickly realizes they are home movies that always end with a family’s death. The families seem to have no relation other than; everyone is killed except for one child who goes missing. At this point the film plays out a lot like a totally different kind of horror where somebody is tracking down what seems to be a serial killer. With every new bit of evidence Ellison discovers he becomes more and more obsessed with how these killings are connected; strange demonic symbols and person referred to as “Mr. Boogie” that is in a few frames of every killing dating back to the 1960’s. Ellison learns through a convenient connection through a local cop that these symbols are of Bagul: the eater of children. He lives in the images and once you’ve seen them it’s already too late. Ellison has to uncover the mystery of Bagul and the murders but the creeping dread that surrounds him is getting worse every day and the real question is he able to hold on to his sanity and forget his desire for literary fame long enough to save his family? This film has a lot going for it in terms of premise and style. I liked the use of the 8mm film in a lot of places because it gives a gritty and raw feel to an otherwise slick Hollywood production. A lot of the film also hinges on Ethan Hawke’s performance while watching the grotesque images on the film which he does admirably. The scares come frequently but people who are not fans of cheap-shot jumps will probably become frustrated as the film relies heavily on “loud noises” to create the startling effects. The most disturbing scenes come from the films themselves which are silent and the audience only has the rhythmic flicker of the tapes to accompany the grizzly murders and in this sense there is nothing supernatural about it. An amazingly effective scene has Ethan Hawke slowly walking his house with a baseball bat while creepy ghost children keep rather skilfully out of his peripheral is in my opinion the highlight of the film. The film falls short in several key areas. I felt a lot of the scares were predictable in that nothing really startled me at all. Also, like my complaints with another recent film The Possession” It felt all too familiar in certain key areas. Demon, obsession, angry police, occult expert shows up, inner family turmoil and things of that ilk. Another thing I thought could have been done better was the overall look of Bagul. He looked like some Slipknot reject and while scenes with him actually in it are few I was waiting for him to just bust out a face melting guitar solo. Sinister overall gets a passing grade from me. Even though the film has its fair share of clichés- It’s a solid movie to help you enjoy your Halloween season with. It cleverly does a balancing act between a true crime horror and a haunted house movie with a little dash of Asian horror. Hawke’s performance as I mentioned is excellent and I felt sympathetic to him in the end. (spoiler alert) no happy endings here which is something that always gets extra points from me. This entry was posted on October 13, 2012 at 2:34 pm and is filed under Updates with tags halloween, horror, movie review, review, Sinister, splatterpictures. You can follow any responses to this entry through the RSS 2.0 feed. You can leave a response, or trackback from your own site.